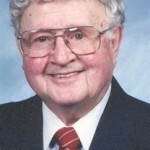 Earl J. Thurston, 88, of Fort Wayne, died on Oct. 27, 2010 at Parkview Hospital. Born Oct. 25, 1922, he was the son of the late G. Earl and L. Faye (Deckhart) Thurston. He was a member of Brookside Church. He retired in 1992 as the owner of Warsaw Restaurant Equipment. He previously had been the Director of Food Services at Grace College and Manager of their Conference Center. He is survived by daughters Pamela Schimer of Fort Wayne; Katherine Winters of Fairfield, OH; Cynthia (Robert) Rohlfing and Debra (Todd) Meeks both of Fort Wayne; sons Tim Thurston of Coldwater, MI and David (Diane) Thurston of Fort Wayne; 16 grandchildren; 10 great grandchildren; 1 great great grandchild and sister, Helen Tillapaugh of Fort Wayne. He was preceded in death by his wife, Genevieve, who died in 1996; son, Thomas Thurston was died in 1972; grandson, Shane Thurston who died in 1995 and granddaughter, Brittney Thurston, who died in 1987.